I HAVE PAID MY ORDER NO.80113692, RS.1099 BY HDFC CREDIT CARD ,BUT WHEN DELIVERY COME DEMANDING MONRY. PLEASE HELP MY CONTACT NO.9821034149. 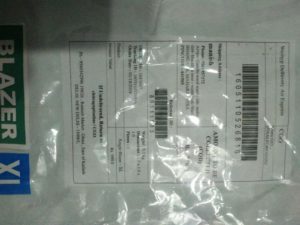 I paid 1099 to wrong blazer …I need to return my product..order no ##80114642..order id 2969866. I have recently ordered a blazer on cliqbay.com but there is no contact provided there. I am afraid what would i do if i have to return or cancel the item. Really bad management there. I even doubt the genuinity of the site. There is no mention of even a customer care. The only customer care they are providing is through whatsapp. Even that is not working. i want to retun my order id 5612719 of blazer color and size mis match..